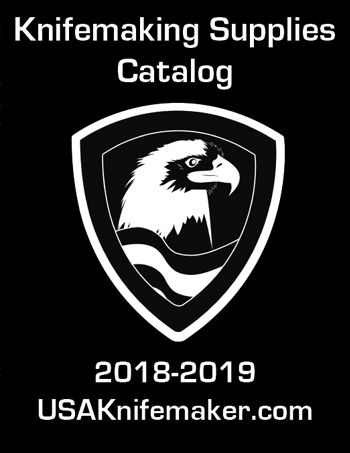 Welcome to our 3rd edition of the USAknifemaker.com catalog. This release weighs in at nearly double the page count of our first catalog with the addition of thousands of new items since our first release. Our goal is simple. We want to be the very best supplier for you in your knife making hobby or profession. We place a high priority on good customer service and having what you need at a fair price.If you ever have a problem with any of our products or service we want to know about it and we want to make it right. We invite you to stop by our knife interest forum, www.KnifeDogs.com, where thousands of knife makers, collectors and enthusiasts share pictures, techniques, and knowledge every day. KnifeDogs is operated as a family friendly environment, where enthusiasts of all skill levels can feel comfortable sharing and asking questions.We also invite you to our YouTube Channel, USAknifemaker, where we have dozens of tutorials that provide instruction and information around knife making. I want your feedback any time, good or bad. We can’t fix something unless we know it’s broken. I want to thank you for your business and we promise to never take you for granted. One last thing, this catalog is a snap shot in time and it is already out of date the day it gets sent to the printer.Stop by USAknifemaker.com to see new items nearly every week.See you on KnifeDogs and thanks again for your business.